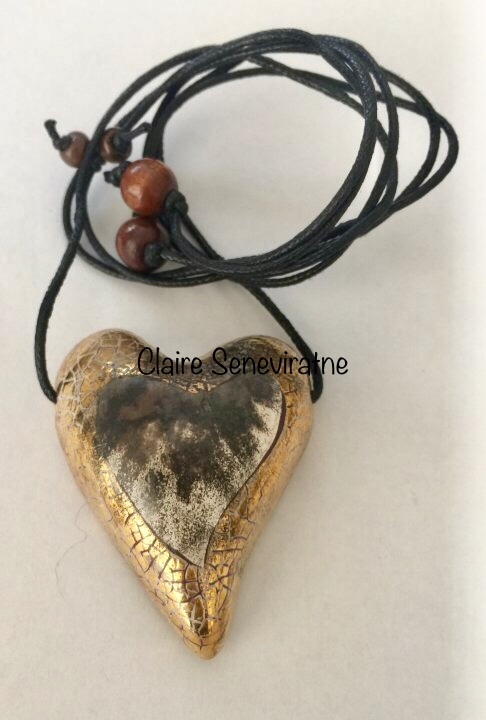 Claire Seneviratne - Ceramic Artist: Smoke fired heart pendant. Gold smoke fired heart pendant.This heart is made from porcelain and has been fired with glaze in my kiln. It has then been refired with a gold lustre. Lastly it has been smoke fired in sawdust to create the unique markings in the centre. It is attached to an adjustable cotton cord. Height of the heart is 5.5cm at the longest part. Width at widest part is 4.2cm.